Mila Kunis wore a stunning emerald green ruched gown with an asymmetrical neckline to the Golden Globes in January. 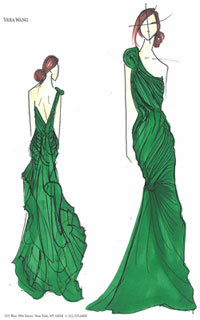 Here you can see a sketch of the dress but fans of the Friends With Benefits star can see the custom gown up close at the Vera Wang store in New York City. This entry was posted in Fashion, Fashion Designers, Vera Wang and tagged fashion designer, Mila Kunis, Vera Wang, Vera Wang blog. Bookmark the permalink.